The Assets pane in Motive lists out all of the assets involved in the Live, or recorded, capture and allows users to manage them. This pane can be accessed under the View tab in Motive or by clicking icon on the main toolbar. List of assets included in the Take. A list of all assets associated with the take is displayed in the Assets pane. Here, view the assets and you can right click on an asset to export, remove, or rename selected asset from the current take. You can also enable or disable assets by checking or unchecking, the box next to each asset. Only enabled assets will be visible in the 3D viewport and used by the auto-labeler to label the markers associated with respective assets. In the Assets pane, the context menu for involved assets can be accessed by clicking on the or by right-clicking on a selected Take(s). The context menu lists out available actions for the corresponding assets. Context menu of a skeleton asset. Exports selected rigid body into Motive trackable files (TRA). Exports selected skeleton into either Motive skeleton file (SKL) or a FBX file. Removes the selected asset from a project. Exports skeleton marker template XML file. Exported XML files can be modified and imported again using the Rename Markers or when creating the skeleton in the Skeleton pane. Imports skeleton marker template XML file onto the selected asset. If you wish to apply the imported XML for labeling, all of the skeleton markers need to be unlabeled and auto-labeled again. Imports the default skeleton marker template XML files. 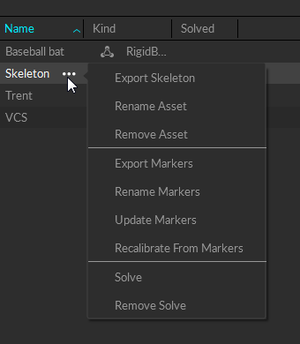 This feature can be used to update skeleton assets that are created before Motive 1.10 to include marker colors and sticks. Re-calibrates an existing skeleton. This feature is essentially same as re-creating a skeleton using the same skeleton markerset. See Skeleton Tracking page for more information on using the skeleton template XML files. This option colors the labeled markers and creates marker sticks that inter-connects between each of consecutive labels. More specifically, this will modify the marker XML file. It adds values to the color attributes and generates MarkerStick elements so that users can export the markers and easily modify the colors and sticks as needed. This page was last modified on 21 May 2018, at 14:30.